There's a lot of talk about high resolution audio right now, which is fantastic for all us audiophiles looking to bring awareness to the audio space, but it seems like this has also generated some confusion as well. So what is high resolution audio? To break it down, streams from basic versions of services like Pandora or Spotify come in quickly at low quality. Buying your music from iTunes, Amazon Music, Google Play, etc., will give you a slightly higher quality. Premium streaming services like Tidal and Deezer Elite offer lossless audio of a high quality. CDs are just raw uncompressed audio recorded at the 16/44 standard, and High Resolution Audio is content recorded at 24/88, 24/96, or 24/192. Those resolutions are basically the "4K" of audio, and like 4K, you may not always notice a difference, but a discerning individual will notice an impactful improvement. This improvement does come at a heavy cost, however. It takes a lot of data and bandwidth to support high resolution, and most would say that the returns are completely diminished at that point. Some poeple are happy to settle for FLAC audio in premium streams, and many are happy to play MP3s. This is what makes Play-Fi and the Phorus products so great. 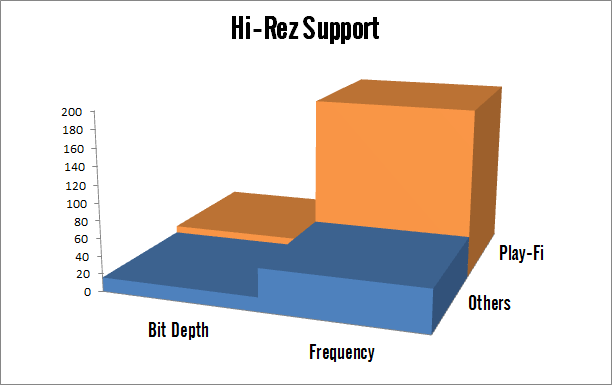 Where almost everyone else only supports up to CD quality audio, we support up to high resolution audio (as illustrated by the very helpful graph below). We know the importance of the audio experience, and we know that it's different from individual to individual, which is why we created the Play-Fi technology to be flexible and supportive of whatever audio experience you prefer, while still retaining the original format's quality. If after all this you want to get your hands on some high resolution audio to test it out in your Phorus products, there are a few places you can go, and we'd recommend HD Tracks and Acoustic Sounds Super HiRez. Whether you're a long-time high resolution audiophile, or if you've newly joined our ranks, let us know in the comments and share where you buy your music! Has anyone had success streaming 16/44 (or better) from Tidal or Deezer? Does anyone know if the LG G2 Android phone stores and plays back 16/44 natively?